Around 426 or 425 BCE, an army from the Peloponnesian League set out to conquer Amphilochian Argos, a city founded on the southeast end of the Ambracian Gulf, and not to be confused with the more widely known Argos in the Peloponnesus. This army, according to Thucydides (c. 460-400 BCE), had around 3,000 heavy infantry hoplites and was commanded by a Spartan general named Eurylochus. In addition to this, a further 3,000 hoplites invaded Amphilochian Argos from pro-Peloponnesian Ambracia, located just north of the Ambracian Gulf. This Ambraciot army was the faster of the two invading forces, so they seized the stronghold of Olpae without Peloponnesian help, and in doing so, gained a strong position just a few miles from Amphilochian Argos. Eurylochus and the Peloponnesian army apparently did not launch their invasion until after the Ambraciots had already seized Olpae. As a result, the Amphilochians had time to muster their manpower and call for Athenian help. As the Ambraciots waited for Eurylochus’ army, the Amphilochians reinforced their city of Argos and placed scouts at a region called Crenae, in order to watch for the Peloponnesian army. 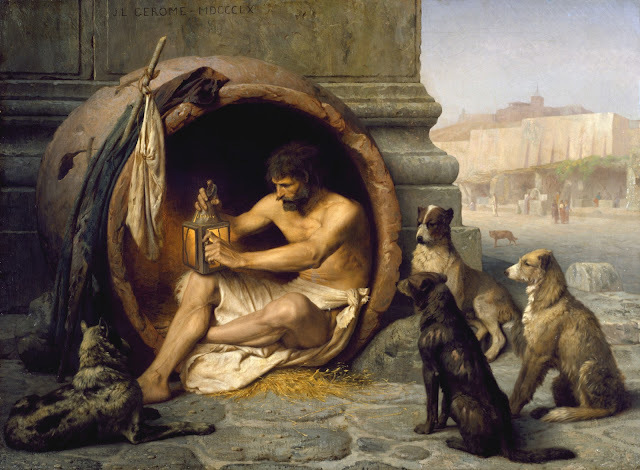 They also successfully contacted, Demosthenes, one of Athens’ craftiest generals—he answered their plea and arrived with twenty ships. His fleet was only carrying a reported 200 hoplites and 60 archers, but Demosthenes’ knack for odd strategies would make up for the lack of numbers. In addition, the Amphilochians also received military aid from Acarnania, a neighboring region that survived a Peloponnesian invasion between 429 and 428 BCE. Demosthenes was appointed as commander-in-chief of this coalition of forces and he marched their united front to challenge the Ambraciots at Olpae. While Demosthenes organized his coalition to march for Olpae, Eurylochus and his Peloponnesian army had not been idle. Eurylochus skillfully weaved his army between towns and cities in Acarnania, Phytia, Limnaea, Agraea and, finally Amphilochia, at which point he somehow managed to unite his force with the Ambraciots without having been noticed by enemy forces. Therefore, when Demosthenes arrived at Olpae, he faced a reported combined force of 6,000 Ambriaciot and Peloponnesian hoplites, all situated on defensible positions. Demosthenes found that the Peloponnesian and Ambraciot armies, although united, were divided into two camps separated by a ravine. The Athenian general positioned his own troops in the ravine. His camp had both advantages and disadvantages—on the one hand, it drove a wedge between the Ambraciot and Peloponnesian armies, but it also left him open for encirclement by the larger enemy forces. Demosthenes was outnumbered, but possibly not by too much, for the Peloponnesian army was wary enough to wait five days before launching an attack. On the sixth day of the showdown, the Peloponnesians and Ambraciots poured down into the ravine to face Demosthenes. The Athenian general’s coalition army mainly consisted of Amphilochians and Acarnanians—these he positioned on his left wing and center. Demosthenes, with the 200 hoplites and 60 archers he brought with him on his fleet, was on the right wing. In addition, Demosthenes gathered together a special band of Acarnanians (known for guerilla and skirmishing tactics), as well as 400 hoplites, and sent them on a hiking trip into a brushy area far to the right of the main army. On the much larger Peloponnesian side, forces were apparently drawn up into two divisions. According to Thucydides, a long continuous line of Ambraciots and Peloponnesians were placed opposite the Amphilochians and Acarnanians. The Spartan general, Eurylochus, with his personal warriors and fighters from Mantinea, lined himself up against the Athenian general, Demosthenes. The Peloponnesian army was so large that, as soon as the two forces formed up their lines, it was immediately apparent that Demosthenes’ right wing, where he was personally stationed, would be easily outflanked and even encircled. When the battle began, the Peloponnesians did, indeed, begin to encircle Demosthenes’ right wing. In addition to this, the Ambraciots and Peloponnesians also shattered Demosthenes’ left wing, pushing the struggling warriors back toward the nearby city of Argos. Morale and momentum in battle, however, is a very fickle thing—as soon as the Athenian right wing began to be encircled, Demosthenes’ hidden Acarnanians and hoplites suddenly rushed out from the tall brush and pounced on the exposed backs of Eurylochus’ personal band. The Spartan general was killed during the surprise attack, as was his second-in-command, Macarius. The death of Eurylochus and the devastation of the best troops in the Peloponnesian army had a devastating impact on the morale of the rest of the troops. Panic spread like wildfire and, before long, the warriors who had been encircling Demosthenes now lost their discipline and ran for their lives. When the Ambraciots and other Peloponnesians, the ones who had chased Demosthenes’ left wing toward Argos, finally returned to the battlefield at the ravine, they found that most of their army had been killed or retreated. Demosthenes attacked these bewildered troops, and forced them, too, into retreat. Many of the retreating warriors managed to reach the fortress of Olpae, where a man named Menedaïus took command as a result of the vacancy left by the deaths of Eurylochus and Macarius. Demosthenes besieged Olpae by land and had his twenty ships blockade the fort by sea. Before long, Menedaïus apparently reached out to Demosthenes and they formed a truce—the Peloponnesians were allowed to leave, but the Ambraciots were left to face the siege. It was difficult, however, for Demosthenes’ troops to discern the Ambraciots from the Peloponnesians, so most of the survivors successfully fled from Olpae. Nevertheless, 200 Ambraciots were reportedly killed either in the final storming of the fortress or while attempting to escape. Even though the Peloponnesians and the Ambraciots from Olpae were retreating, another army of reinforcements had been sent from Ambracia. These troops, unfortunately, arrived on the Amphilochian hills of Idomene after Demosthenes’ victory, and they were unaware of the disaster that had occurred at Olpae. Even worse, scouts that had been posted by Demosthenes witnessed the arrival of this new army in the region. When the scouts reported their findings to Demosthenes, the Athenian general sent his Amphilochian troops into the hillside so that they could use their local knowledge of the geography to occupy all nearby escape routes. Then, with the rest of his army, Demosthenes launched a night attack on the unsuspecting Ambraciots. The attack on the hillside turned into a massacre and any Ambraciot survivors that managed to flee further into the hills ultimately fell into the hands of the watchful Amphilochian troops, who were occupying all of the passes leading out of the region. Thucydides wrote that Ambracia had lost almost all of its fighting-age men in the battles near Olpae. Speaking about this incident, he wrote, “In fact, this was, in all the war, certainly the greatest disaster that fell upon any single Hellenic city in an equal number of days” (History of the Peloponnesian War, Book 3, section 113). In the aftermath of the battle, Ambracia and Amphilochia made a treaty for a century of peace and Corinth sent a band of 300 hoplites to garrison Ambraciot land. 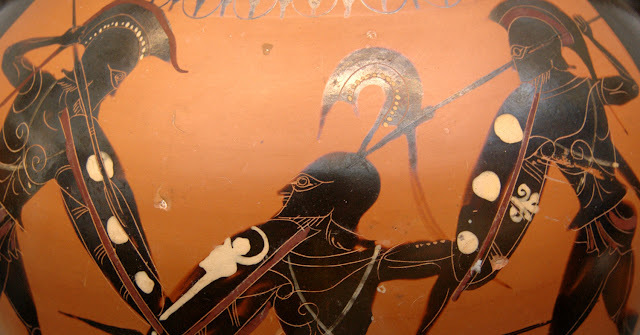 Picture Attribution: (Greek Warriors. Attic black-figure amphora, ca. 530 BC. From Vulci. [Public Domain] via Creative Commons). History of the Peloponnesian War (Book II) by Thucydides, translated by Rex Warner and introduced by M. I. Finley. New York: Penguin Classics, 1972. شكرا على مشاركة المعلومات القيمة.